"My family loves this dish. It is so good! 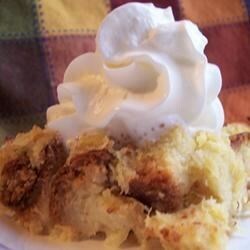 This recipe is more like a bread pudding." Add eggs, milk, pineapple and juice, bread cubes, and vanilla. Mix together. Bake in a 2 quart casserole dish for 45 minutes. We make this all the time but I add coconut and pecans, its heavenly. There are never any leftovers, EVER! The pineapple flavor was great, but way too much butter for me. If I make it again, I'll use much less butter. I love baked pineapple and this recipe was perfect. I have made it for years and found this recipe to be a little easier than my old one. I passed it on to my family. Have made this recipe for years. Always a hit! This was a huge hit at our Thanksgiving table this year. This will be a staple each holiday meal. How could it not be good with all that butter!